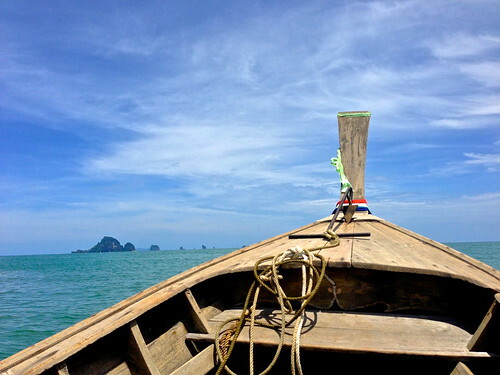 This week’s photo of the week post comes to you from the back of a long tail boat in Krabi, Thailand! Ok, maybe I’m not actually on the boat writing this right now, but that’s only because it didn’t have wifi. This post actually comes to you as Greg and I sit in a private cabana in Koh Samui, Thailand next to the pool as we sip on piña coladas. We upgraded from our I Love Lucy style $16 digs to our much more than $16 amazingly beautiful resort style digs celebrating our 1 year anniversary. It’s going to be very hard to stay in a hostel tomorrow night. Focus, Casi! Focus! This post is not about how we’re sitting around in cabanas reading our Kindle, drinking piña coladas, sleeping on a big comfy bed, or watching the sunset from the beach bar! This post is about all of the modes of transportation we have been taking recently. Before Malaysia it was basically airplanes, cabs, and subways. But now we have added trains, shuttle busses with and without aircon (guess which one we like more), jeepney’s that I was sure would fall apart into pieces, and boats of all kinds. Including this long tail boat we took to my new favorite beach in the whole wide world. Just last week we did all of those modes of transportation, and even though we’re sitting for most of that time it’s tiring! We planed to Kuala Lumpur, overnight trained to Penang, shuttle bussed over the boarder into Thailand (which was an experience in itself), then hopped on another shuttle bus since this shuttle bus guy didn’t realize he had to take us an additional 4 hours to Krabi, hopped on a questionable jeepney after 2nd shuttle bus guy decided to not take us all the way into town, then we long tail boated to different islands, shuttle bussed again, double decker bussed it to the east coast of Thailand, boated, and shuttle bussed it to where I sit right now. Happy to not be in a moving vehicle. Although, we are working on our boat->boat->bus->train->bus ride to Bangkok as we speak. Hence the piña colada at 11am. Enjoy Bangkok. Love your pics on Instagram. I love the different modes of transport in different countries. In Kosovo, the locals attach old tractor parts to a donkey. We called them Kosovo Harleys.